Bay Area artist Masako Miki has fashioned a brightly colored, humorous forest of Yo-kai — shape-shifting beings (including objects like mirrors, prayer beads, and back-scratchers) derived from Japanese folklore. 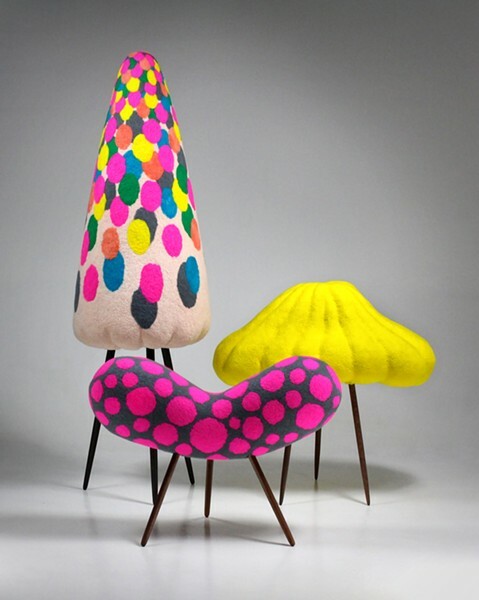 Made from felt-covered industrial blue foam set atop tripods of spindly wooden legs, the organic, biomorphic creatures recall Surrealist works by Arp and Mirò, while the turned hardwood legs may conjure memories for some viewers of ‘Danish Modern’ furniture of the 1950s. The multiplicity of forms that these supernatural beings can assume — analogous to immigrant Americans’ dueling identities — jibes nicely with current ideas about the tenuousness of identity in our digital-culture forest, with its virtual-reality avatars. The enamel paint blobs on the gallery’s floors and walls suggest easy slippages between 2D and 3D. A companion show by Miki is on view at CULT Aimee Friberg Exhibitions in San Francisco through Feb. 23.